According to Hispanic Business Magazine, Alvarez is ranked as one of the most influential Hispanics of all time. He is the university’s all-time leader in wins as a football coach & as a coach, he guided the Badgers to three Big Ten championships & three Rose Bowl victories. Since assuming his role as athletic director in 2006, the UW men’s hockey team earned its sixth national championship. Also, the women’s hockey program has won four national titles. The UW football program has continued to flourish with Alvarez as AD, and the UW basketball team has been an annual player in the NCAA tournament. 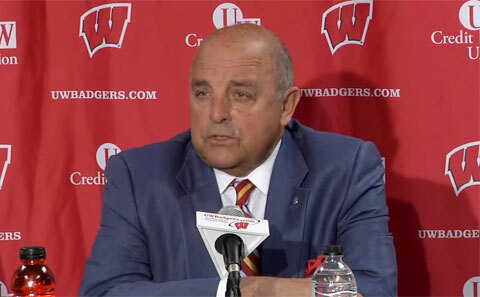 Watch October 2013 video where University of Wisconsin Athletic Director, Barry Alvarez speaks to the media at college football playoff press conference. Playing Field Promotions is a booking agent for motivational sports speakers and celebrities. If you would like to book sports speakers or coaches like Barry Alvarez for a speaking engagement, guest appearance, charity fundraiser or special corporate event, you can contact our booking agent for appearance and speaker fees or call 1.800.966.1380.